Forget BLT, try a TLT! Vegan, high in protein and simply delicious! Pre-heat oven to 190C/375F. Drain and press the tofu. In a bowl, mix the rest of the bacon tofu ingredients. Taste and adjust the flavour. Slice the tofu thinly, and line a baking tray. Cover each tofu slice in the sauce mixture and place on the baking tray. 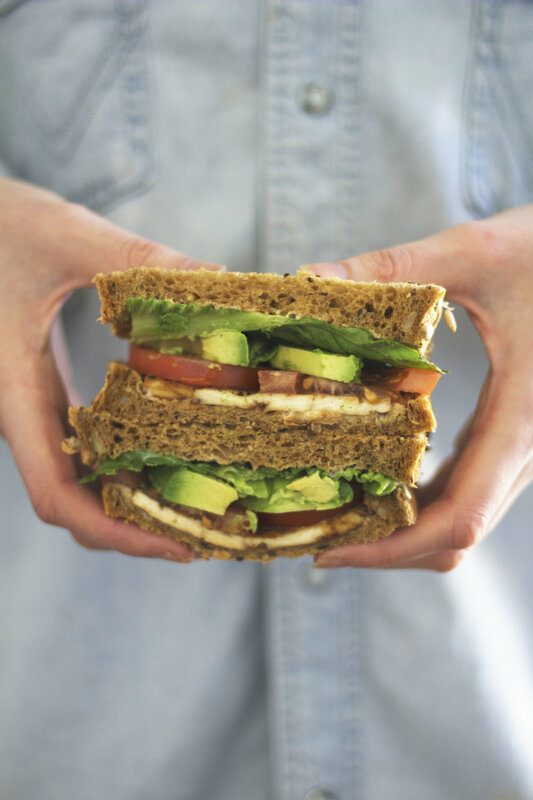 While the tofu is baking, slice the bread, tomato, avocado and lettuce ready for the sandwich to be assembled. When the tofu is cooked, load up the sandwich with some vegan mayo, the tofu, tomato, avocado, lettuce and ketchup. Slice and enjoy! Try this tofu out on a rice bowl, in a wrap, on top of a salad or with anything else you fancy! It is a great and easy meat replacement. If you're worried about getting enough protein on a vegan or vegetarian diet, tofu is a great high protein food!